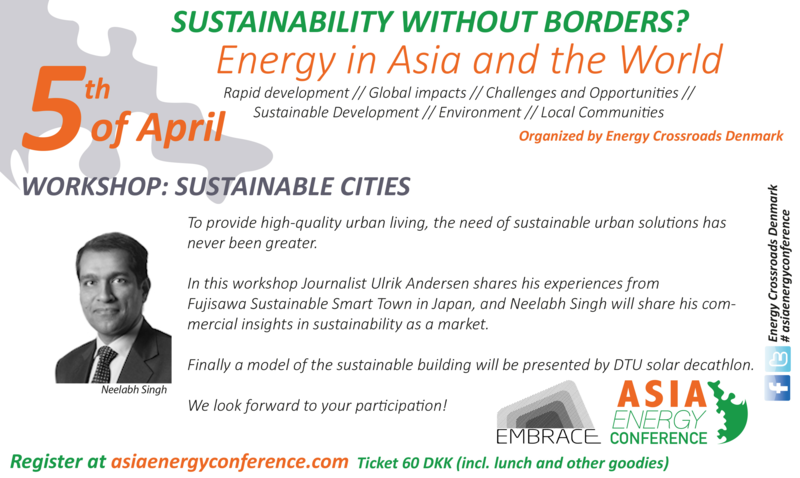 Asia and the World – Sustainability without borders? 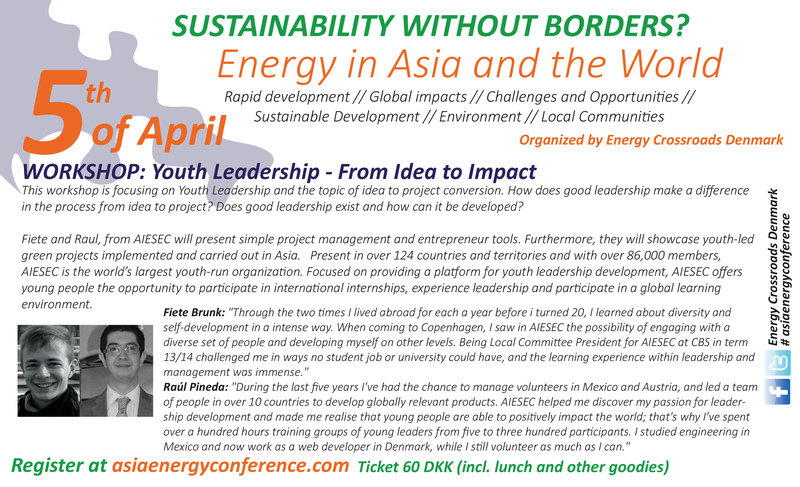 was a one-day international student conference, gave students the opportunity to learn about Asia’s current and future developments in sustainable energy generation, the manufacturing of goods and how demographic changes and consumer habits may affect these parameters. Multicultural & Multidisciplinary Audience: We want to encourage discussions influenced by various world views. Asia’s Ongoing Development: We strive to focus on how different parts of the world experience Asia’s development and how a long-lasting sustainable impact can be created, given those perceptions. Acquire knowledge through hands-on experiences in workshops. 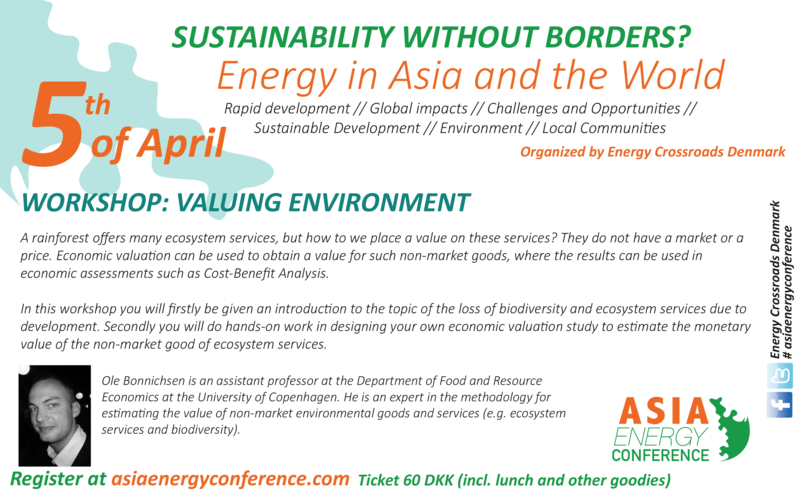 The conference Asia and the World – sustainability without borders? took place on April 5th, 2014. The event was host at Copenhagen University, LIFE, Marble Hall, Thorvaldsensvej 40, 1871 Frederiksberg C.
A rainforest offers many ecosystem services, but how to we place a value on these services? They do not have a market or a price. Economic valuation can be used to obtain a value for such non-market goods. Transportation poses a significant challenge to sustainable development. This is especially the case in Asian countries where the demand for personal vehicles is growing and freight transport is rapidly developing. Our Expert Facilitator: Subash Dhar and Susanne Krawack. While sustainability continues to be the most often discussed in relation to planning, economics and the environment, there is an increasing interest in exploring how culture can be both a barrier and a tool for achieving sustanability. Our Expert Facilitator: Michael Plesner. 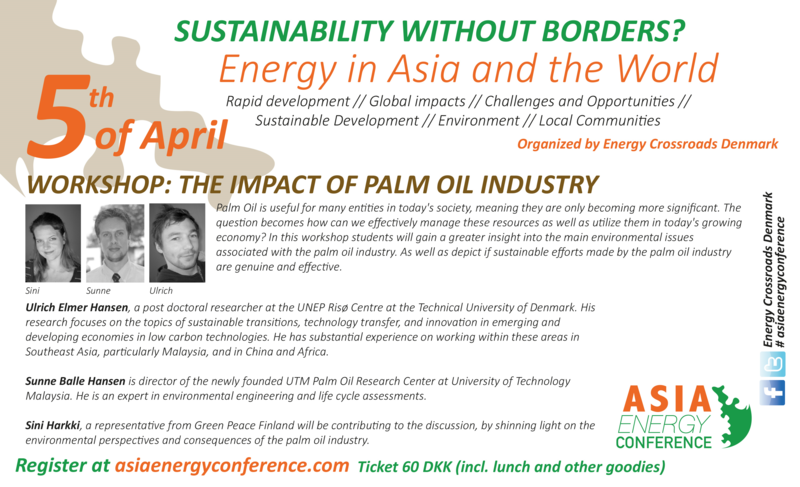 Palm Oil is useful for many entitles in today’s society. The question becomes how can we effectively manage these resources as well as utilize them in today’s growing economy? Our Expert Facilitators: Ulrich elmer Hansen, Susane Balle Hansen and Sini Harkki. To provide high-quality urban living, the need of sustainable solutions has never been greater. Our Expert Facilitator: Ulrik Andersen and Neelabh Singh. 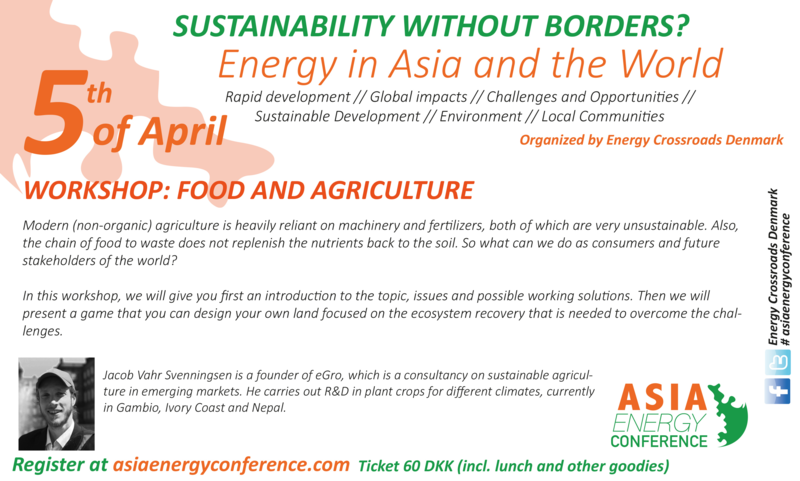 Modern (non-organic) agriculture is heavily reliant on machinery and fertilizers, both of which are ver unsustainable. Also the chain of food to waste does not replenish the nutrients back to the soil. So what can we do as consumers and future stakeholders of the world?. Our Expert Facilitator: Jacob Vahr Svenningsen. 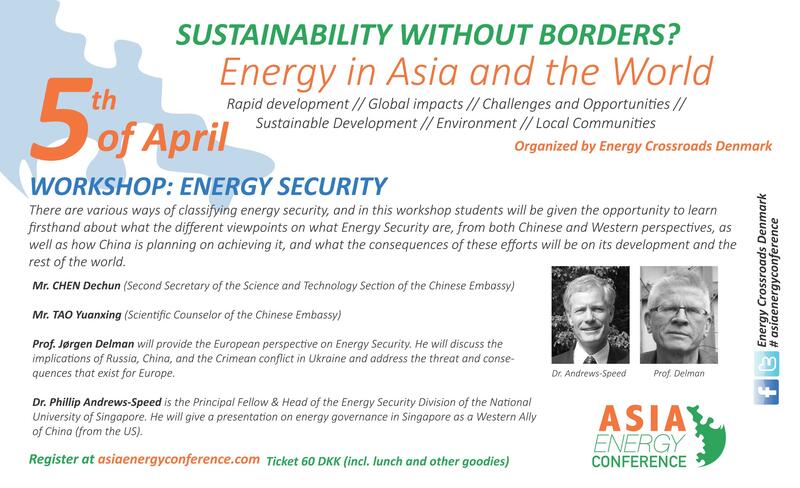 What is Energy Security, from Chinese and Western perspective. 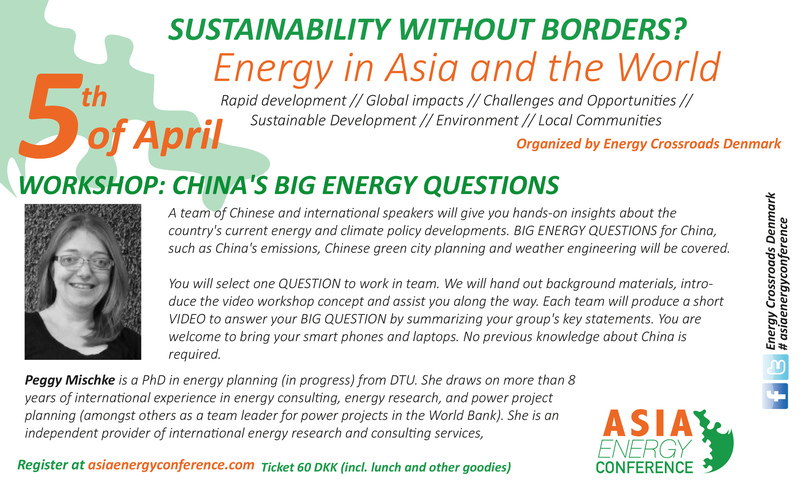 How china is planning on achieving energy Security and what will be the consequences of these efforts on China’s development and the rest of the world. 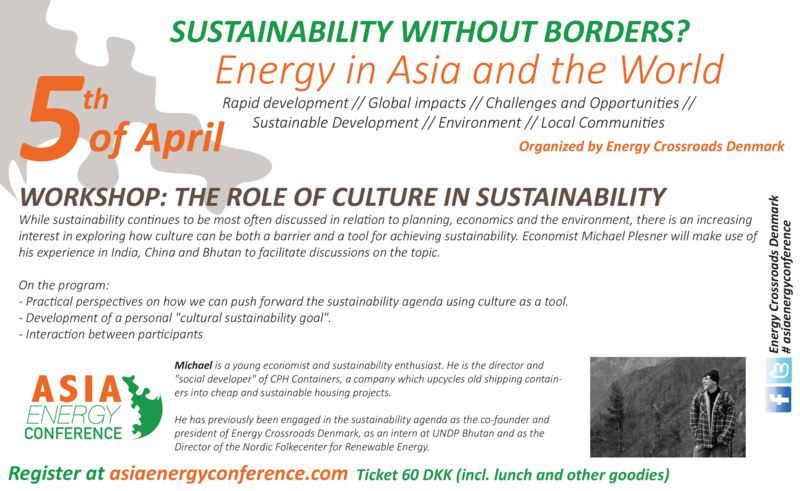 Our Expert Facilitators: Mr.Chen Dechun, Mr TAO Yuanxing, Prof.Jørgen Delman and Dr. Phillip Andrews-Speed . China’s current energy and climate policy development. Chinese green city planning. Our Expert Facilitator: Peggy Mischke. How does good leadership make a difference in the process from idea to project? does good leadership exist and how can it be developed?. Our Expert Facilitators: Fiette Brunk and Raúl Pineda. 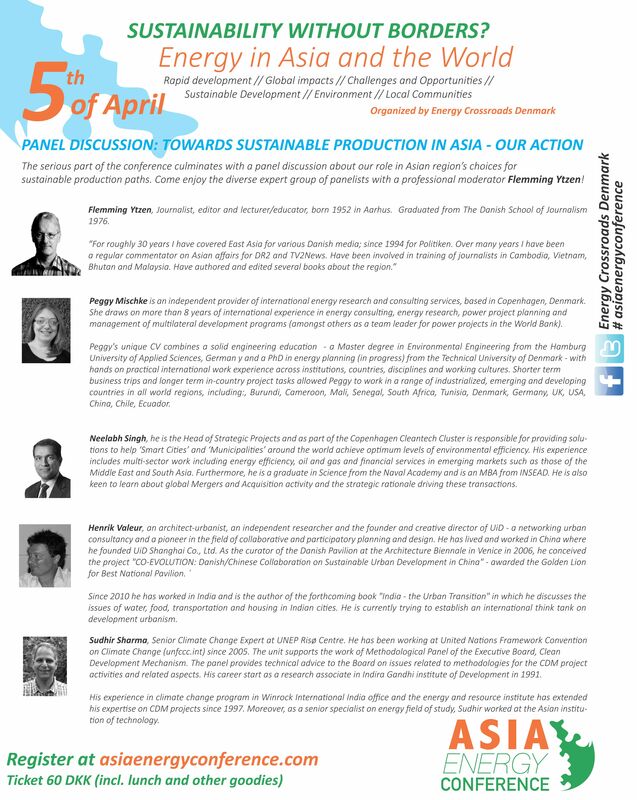 Our role in Asia’s region’s choices for sustainable production paths. Panelist: Peggy Mischke, Neelabh Singh, Henrik Valeur, Sudhir Sharma. Energy Crossroads has allowed Piret to create and participate in many energy and sustainability related projects. 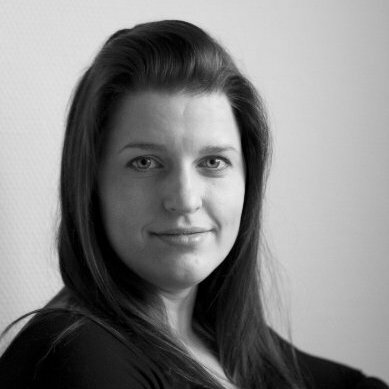 Piret is currently working at Climate-KIC with Online Education and enjoy the multicultural and multidisciplinary set-up for creating learning materials for people active in climate change mitigation activities. Piret has a background in environmental economics.